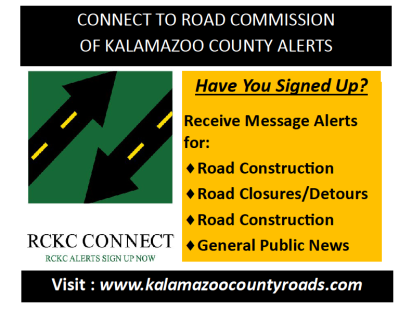 The Road Commission of Kalamazoo County (RCKC) announces a new mass notification service. RCKC CONNECT is a mass notification service for community outreach communications. Messages from RCKC CONNECT include road construction updates, unexpected road closures, detours and other important RCKC news. Citizens receive important time sensitive messages of their choosing, by phone at home or work, mobile phones, text message, email or via the mobile member application Everbridge CONTACTBRIDGE. Citizens pick where and how they wish to receive notifications. Citizens may sign up using their Mobile Device or Desktop by visiting RCKC website home page www.kalamazoocountyroads.com .